Houstonians, and everyone else, can learn more about Houston’s Huelga Schools of the 1970s thanks to the efforts of Jacob Tate, a student at Pin Oaks Middle School. Tate spent several months last school year creating a website about Huelga Schools as part of a project for a regional History fair. When the Houston Independent School District (HISD) began to integrate its schools in 1970, it used a plan that only integrated Hispanics and African-Americans. Hispanics believed that this plan was racist and unjust, so they boycotted the schools. Special “huelga” (strike) schools were formed to educate boycotting students. The boycotts did not end until HISD drew up a fair integration plan in 1972. Because of this movement, Hispanics now have a better education and therefore, a better future. The website includes quite a bit of historical context, documents and interviews to give a complete view of the boycott, the schools and the victory. 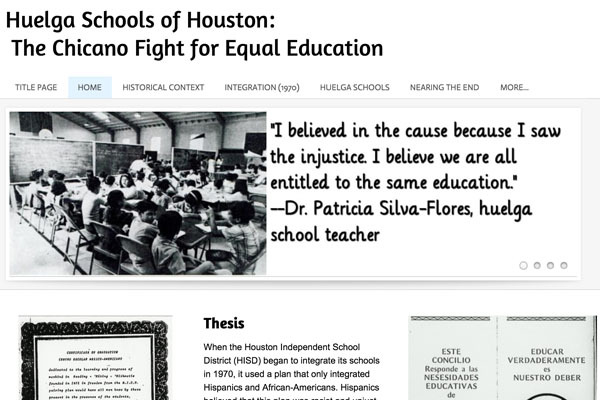 You can read more about the Huelga Schools of Houston at the website Tate built.